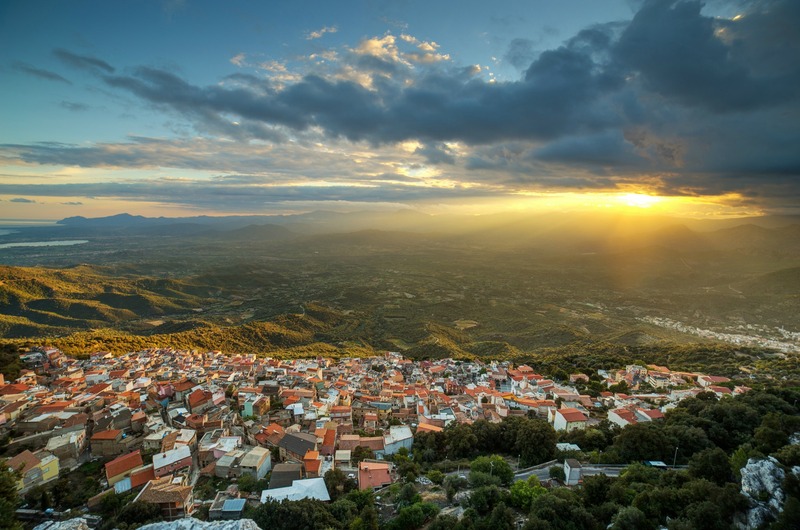 A village “clinging to a sheer slope on the limestone ridge of Monte Santo - as the historian Vittorio Angius wrote - isolated in the isolated Ogliastra”. 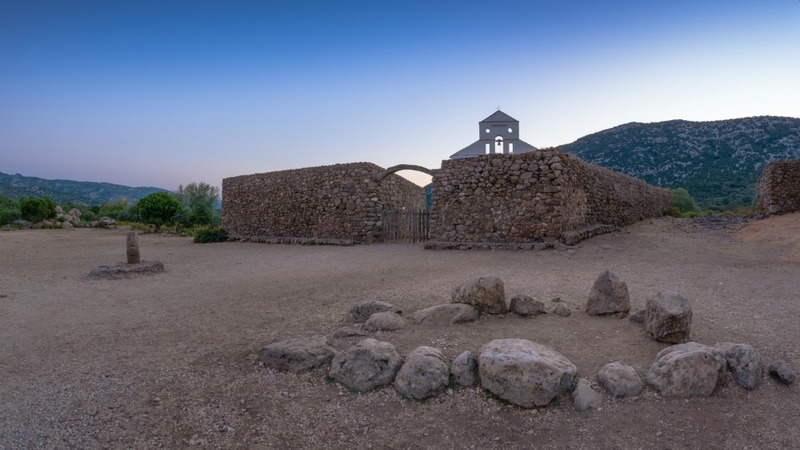 The panoramic position overlooking the valley below, makes the folk tale about its founding more credible: a goatherd created Baunei on the rocky elevation, at an altitude of almost 500 metres, to escape from the Arabs who were trying to invade in 1015. In the centre of the ‘steep’ village, which now has a population of three thousand 600 inhabitants, the Nicola di Bari parish church stands out, with its seventeenth century structure that was renovated in the 20th century. 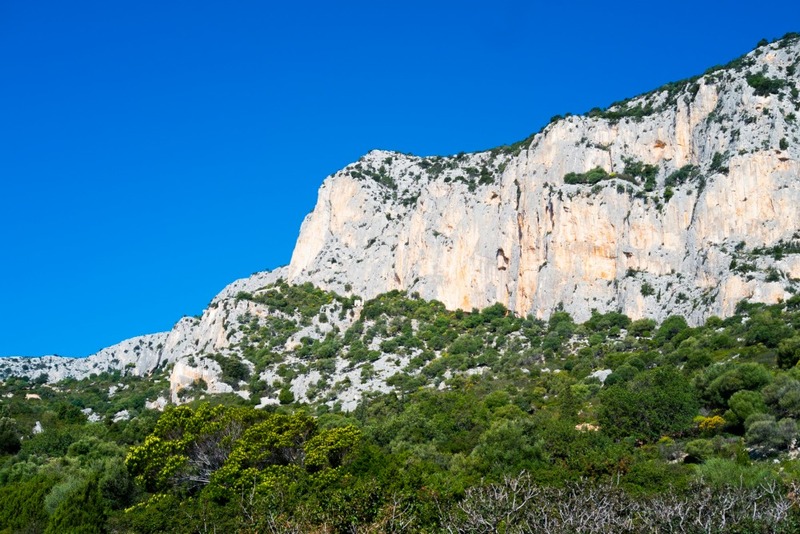 The Supramonte mountain range of Baunei, the home of hiking, extends around the village, with trekking trails that stretch from the mountains to the sea and its vertical rock faces are a rock climbing paradise. In particular, a gully leads to the natural monument, Pedra Longa, a pointed pinnacle 128 metres high, overlooking the sea. Eight kilometres of spectacular hairpin bends take you from the village to the heart of the big, silent Golgo plateau, covered with a dark, basaltic lava flow standing out against the whitish colour of the surrounding limestone rocks. From up there, at an altitude of 630 metres, you will enjoy a breathtaking view that stretches from Gennargentu to the Gulf of Orosei. Here, a launching pad has been set up for paragliding. The plateau is famous for su Sterru, another natural monument, the deepest single span karst chasm in Europe. The chasm (270 metres deep) is dense with mysterious legends: it was said to have been a snake’s lair, the threat of which was thwarted by the construction of the nearby Church of San Pietro, celebrated at the end of June, along with the feast of goat meat. Limestone cliffs and bastions overlooking the deep waters with iridescent colours, broken here and there by pebbled coves and crossed by codule and canyons that reach the sea forming soft white sandy beaches. 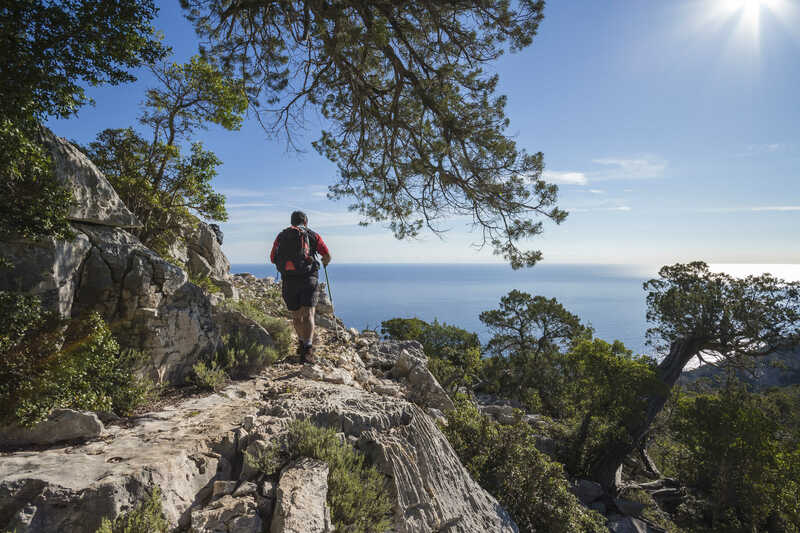 These are the distinctive features of the Baunei coastline, which extends for 40 kilometres along the southern part of the gulf, one of the wildest and most evocative stretches in the Mediterranean. The district of Santa Maria Navarrese is located on the coast, facing the islet of Ogliastra. A legend links the coastal district to a Spanish princess, who had been driven out or who had fled from Navarra: in 1052, the young woman took refuge from a storm in a bay, where, in the shade of some olive trees thousands of years old, she had a little white church built, to express her thanks for being safe from danger. Around it, an enchanting little village arose by the sea and today it is one of the most popular tourist centres along the eastern coast. From its modern port, you can get to the beaches that symbolize Ogliastra. 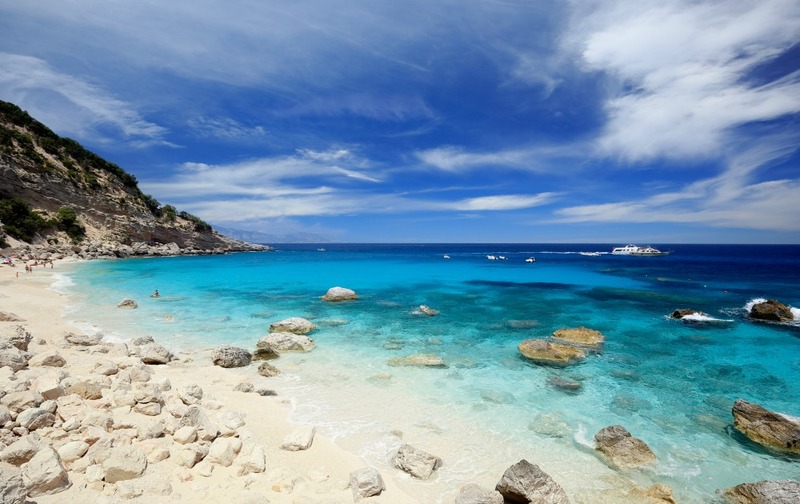 The transparent, turquoise waters of Cala Goloritzè, a national monument, flow from underwater springs, between marble rocks shaped by time and lush vegetation. A majestic pinnacle stands above it and it is the home of climbing enthusiasts. 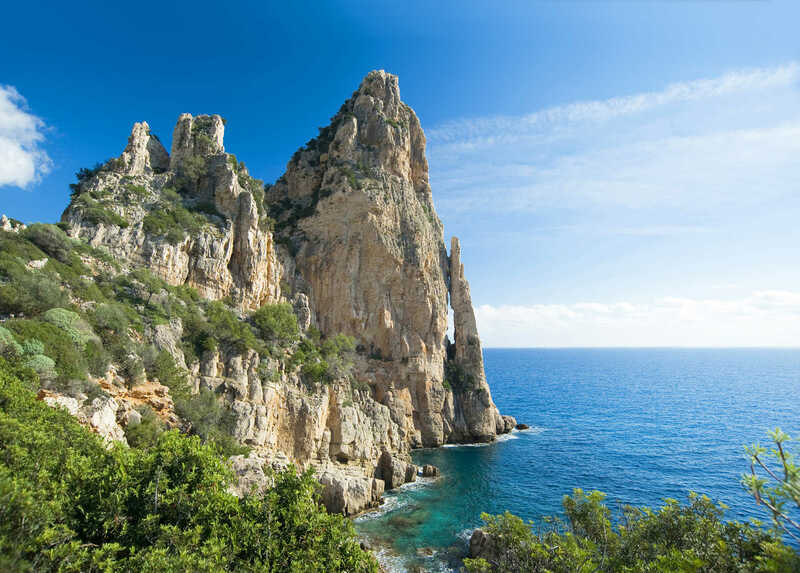 You can also get to Cala Biriola along a long trekking trail: it opens up at the end of a holm oak and juniper forest. If you choose to use a boat or a dinghy, before you get there, take a dip in the Piscine di Venere. 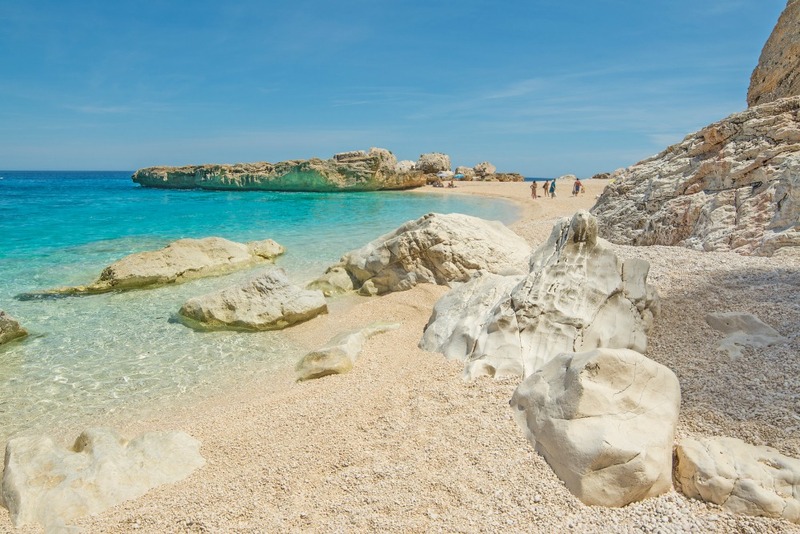 Cala Mariolu and its ‘little sister’ Cala dei Gabbiani are protected by a 500-metre cliff and are striking as a result of their blue, emerald green and azure waters and round pink and white pebbles, mixed with sand, that resemble snowflakes. Cala Sisine appears at the end of an ancient riverbed covered in centuries-old trees: this is one of the most beautiful sea resorts and has a unique mountain view. Lastly, Cala Luna is like the setting for a film – halfway between the territory of Dorgali – with its limestone craters, it looks as if the sea is inside an ampoule. The Supramonte also conceals an underground world, marked by the patient work of the water, with deep tunnels and unusual stalactites and stalagmites, looking out onto the sea. These are places where time stood still 800,000 years ago, like Grotta del Fico and another miracle of nature, Grotta del Miracolo. Inside it, the reason for its name becomes clear. The beautiful natural heritage is the habitat of rare species and an open-air archaeological museum. At Cala Luna, in the su Marinaiu cave, traces of the first settlements dating back to the Eneolithic period have been found. The most significant evidence is of the Nuragic civilization, especially in the plateaus of Margine and Golgo, where famous bronzes were discovered and are on display at the Archaeological Museum of Cagliari.